Finally someone gets it right. HE watches you all the time! HE has a list, and HE’s checking it twice. He’s knows who’s been naughty and nice. HE’s… Wait a second here folks. GOD watches us all the time. 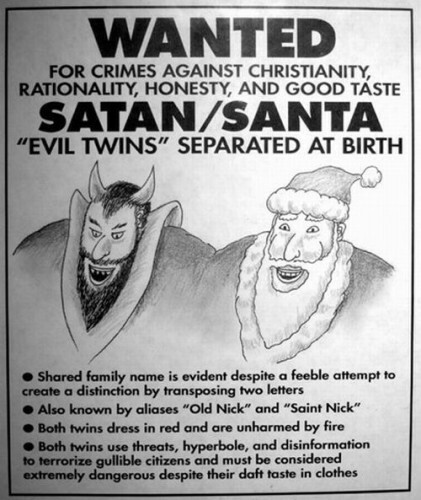 GOD knows who’s been naughty and nice. GOD’s son’s birthday is Christmas Eve. OMG (Sorry GOD), GOD IS SANTA!!! Damn Fundies; always trying to ruin my Christmas. Let us not forget jehova, who might not fit the bill for fashion sense but certainly on threats, disinformation and a lot more. God doesn’t feed lies or harm the innocent. All the roman emperors who were Christians were more powerful than the rest and won all their battles. Whereas pagan roman emperors were the worst emperors and achieved nothing. Why is this? It’s because the Christian roman emperors were blessed by God.